Get quality trackplotting with the high-sensitivity GPS 152H, a grayscale trackplotter with easy-to-use features that fits both your boat and your budget. The GPS 152H features a high-sensitivity GPS receiver, an internal GPS antenna and a built-in BNC connector for an optional external antenna connection to ensure that you acquire satellite signals quickly, regardless of your position. It also can receive position corrections from the Wide Area Augmentation System (WAAS), which makes its already-accurate positioning data even more reliable. In fact, when you turn on WAAS, you can increase the accuracy of the 152H's position reporting to within 3 m (9.84 ft). 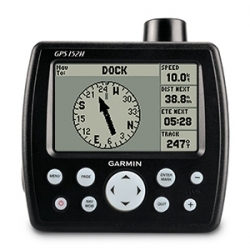 With an increased memory, the GPS 152H can store up to 3,000 waypoints and 50 routes. And the 4" (10.16 cm) diagonal high-contrast display makes it easy to see and navigate to waypoints or other places. We've also added a NMEA 0183 output so you can send position data to another electronic device on your boat.